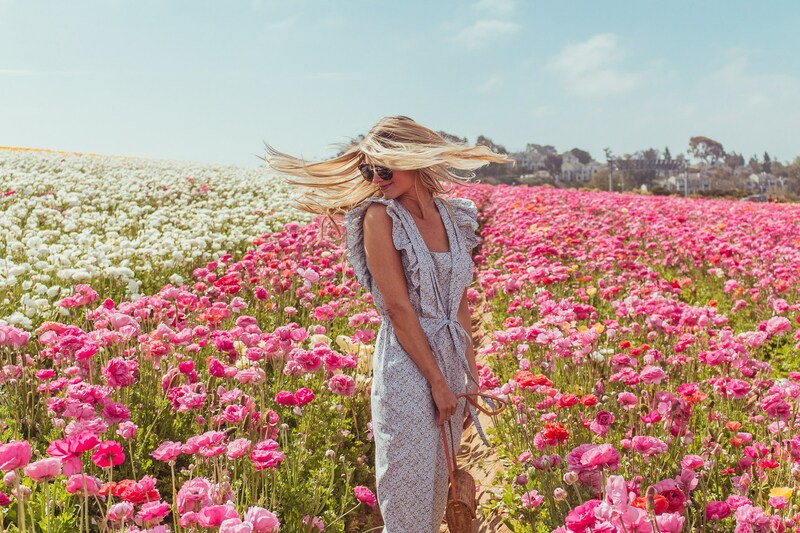 These shots in the Carlsbad Flower Fields from last year make me so happy! It was so fun to shoot there… even if we were being sneaky hoping over the green tape and breaking the rules. Today’s post is all about one of my favorite things to wear – a jumpsuit! And something I can’t wait to start wearing again. Getting me so excited to do some postpartum shopping. 🙂 I actually found the one I’m wearing in stock here as well as in a pink floral print that I’ll link below. Plus several others in various price points that I love for spring and summer. 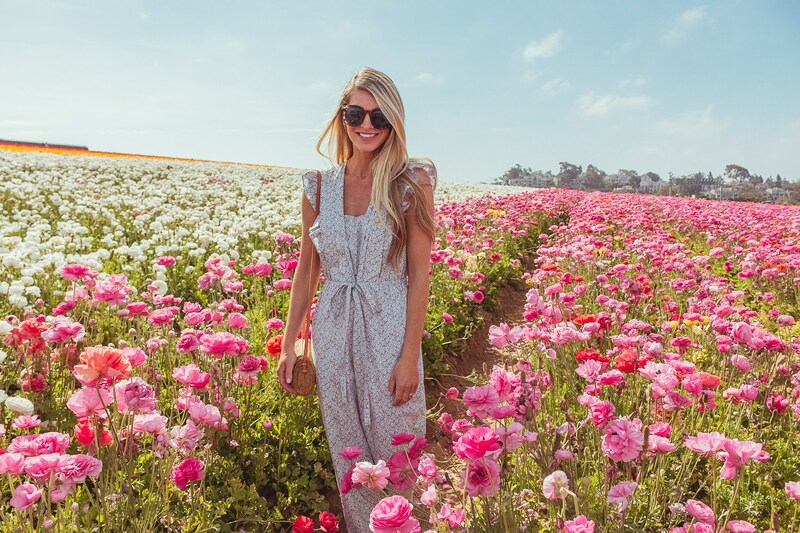 Here’s the Rebecca Taylor jumpsuit in this year’s pink color way. It would be so pretty for Easter! (Found it at two other retailers here and here as well). I think I need to order this leopard print culotte jumpsuit! Dying over how cute it is and it’s only $32! A cute striped jumpsuit that comes in two different color options for under $60. This jumpsuit looks so comfy and practical but still cute. Something I could wear in the day with the kids and dress up a bit with cute sandals for dinner. Another great budget friendly option – loving the denim! I saw someone wearing this one pregnant and it was darling! But I also love it sans bump. I’m loving this beachy white embroidered jumpsuit for summer, it’s right at $70. I tried this one on a couple weeks ago (with my giant bump) and think it would be really cute both ways – pregs or regs. Such a pretty neutral print. Would look so cute with a denim jacket and espadrilles. Loving the criss-cross back and subtle stripes on this one. Another cute option to dress up or down. This subtle sage green ribbed option looks so comfy and can be dressed up or down.